Most tasks in Project 2013 (except milestones) have a duration, whether it’s ten minutes or a year or another span of time. The needs of your project and the degree of control you require determine how finely you break down your tasks. If your project is to launch a satellite, for example, tracking the task duration by minutes on launch day makes sense. In most other circumstances, tracking the duration by days (or weeks, sometimes) is sufficient. Double-click a task to display the Task Information dialog box. If necessary, click the General tab to display it. In the Duration box, use the spinner arrows to increase or decrease the duration. If the current duration units aren’t appropriate (for example, days when you want hours), type a new duration in the Duration box. Don’t assume that changing the start and finish dates of a task changes its duration; it doesn’t. You have to manually change the duration. If you don’t, your project plan won’t be what you intended. Click the OK button to accept the duration setting. 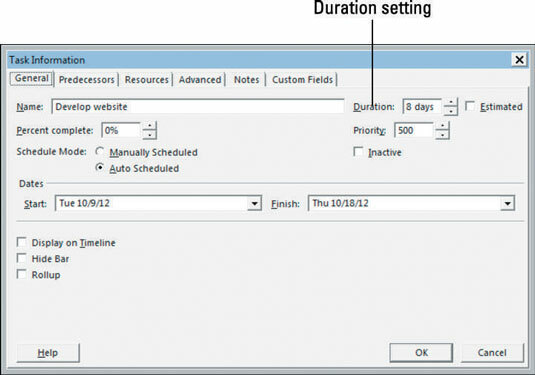 If you’re unsure about the timing of a particular task, select the Estimated check box (on the General tab) when you enter the duration. This strategy alerts people to your lack of certainty. You can always go back and uncheck the box when you have better information.